The Belt and Road Initiative is shuffling cards in many decks, unsettling entrenched power relations and spheres of influence. Nepal’s geopolitical position has new impetus, thanks to China’s Belt and Road Initiative. The landlocked nation has an opportunity to play China and India to improve its bargaining position. In September, delegations from Nepal and China gathered in Kathmandu to finalise the text of a Trade and Transit Protocol, destined to actualise the Trade and Transit Agreement the two sides had concluded in March 2016. This was a sudden turn of events from a mere two months earlier, when Nepal’s Maoist Prime Minister KP Sharma Oli paid an official visit to Beijing and agreement still appeared to be up in the air. The freshly minted protocol, due for signature presumably during Chinese President Xi Jinping’s scheduled visit to Nepal in April, grants use of four Chinese seaports – Tianjin, Shenzhen, Lianyungang, Zhanjiang – as well as the dry ports of Lhanzin, Lhasa, Xigatsê to Nepal for third-party trade. All six border crossings between the two countries are included in the protocol. 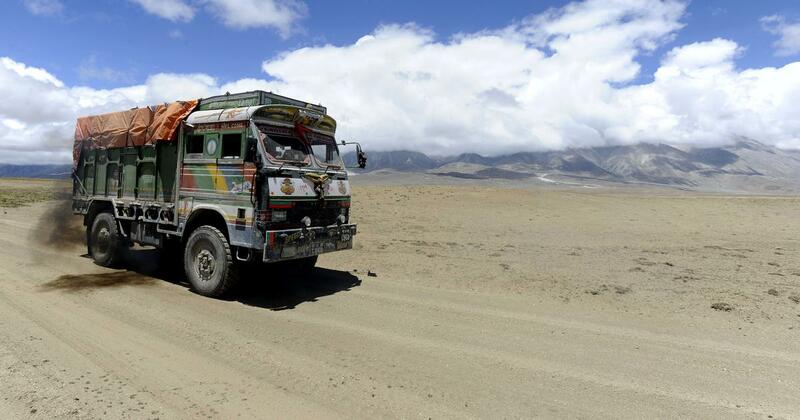 Nepali vehicles can enter Chinese territory to ferry goods, without designating specific routes, and the protocol may include additional ports at a later stage. 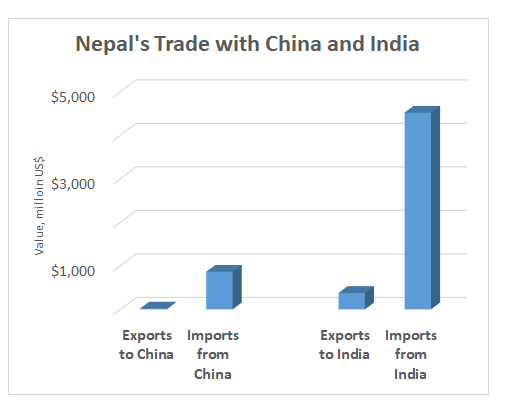 Nepal has historically relied on India for about 98% of its transit trade, primarily through the ports of Kolkata and Visakhapatnam, but the new deal with China reverses that dependence. Although India and Nepal share no less than 25 border crossings, the current arrangement imposes numerous delays and bottlenecks. Dwell times are seven days in Kolkata and two in Visakhapatnam, and overall transport time for goods can take up to three months. Intricate customs procedures oblige Nepalese traders to produce original invoices in order to clear their goods. Due to these complexities, Nepal has requested a third gateway. The dependence on India has also exposed Nepal to blackmail and other pressure tactics – as demonstrated unequivocally in September 2015, when Delhi subjected Nepal to a blockade that lasted through the following March, bringing the economy to a standstill and causing major disruptions in the supply of vital goods like fuel and medicines. Stakeholders in Nepal welcomed the announcement with caution, mindful of a similar agreement Kathmandu signed with Bangladesh in 1976 that failed to alter the trade predicament, since that route still requires transit through an uncooperative India. They also point to the rough Himalayan terrain and the poor state of roads and border infrastructure within Nepal – currently only the Rasuwagadhi-Gyirong route is viable. Others noted the distance of Chinese ports, some 4,000 km to 4,600 km from the border, though the dry ports are 400 km to 800 km away. Notwithstanding such caution, the agreement is potentially a gamechanger in several ways. Consider Kazakhstan’s railways diplomacy, designed to attract investments from Asia, Eurasia and Europe, while including large amounts of Chinese funding. That solution has allowed the landlocked Central Asian country to manage its overland connectivity in a way that lessens vulnerabilities and expands opportunities, positioning the country at the center of transcontinental transport routes. Nepal’s recent deals appear to replicate the rationale of Astana’s approach, implemented successfully over the past two decades. This shows how a strategy of diversification is an increasingly attractive option for governments seeking greater independence, and Nepal can anticipate four advantages. 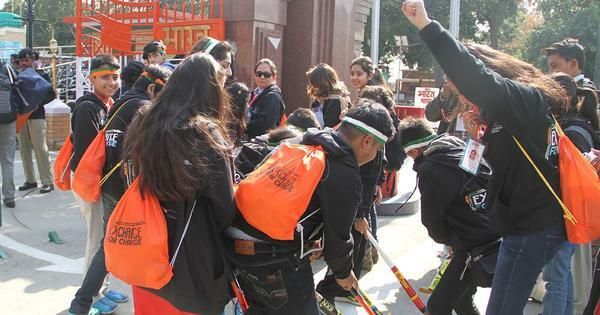 First, while the new connectivity will not break Nepal’s strong cultural, religious, social and military ties to India, it loosens longstanding dependence. India will no longer be Nepal’s sole conduit to the oceans, and this is bound to have a sovereignty-enhancing effect. With a second option available and an enhanced partnership with China, Nepal gains the ability, in principle, to offset future blackmail attempts and pursue independent foreign and domestic policies. Second, the new link will likely increase Nepal’s bargaining leverage, putting it in the position of arbitrating a bidding war between China and India. Reports suggest since negotiations were launched, this new dynamic has already played out in Nepal’s dealings with India. For example, a complementary agreement between Nepal and China eyes a Kathmandu-Gyirong railway, and China has committed to extend the Lhasa-Xigatsê railway to Gyirong by 2020. At railhead, the line will connect to the Gyirong Port and Economic Cooperation Zone, which appears destined to become a “South Asian Khorgos” of sorts, linking that region to China’s network and taking its name from the Chinese border city and largest dry port in the world. Beijing will also assist in repairing Nepal’s Araniko and Syabrubesi-Rasuwagadhi highways. India has made similar pledges, already building two rail lines, with three more planned. Delhi agreed to give Nepal dedicated access to the port of Vizag during Oli’s February visit. On the other hand, the protocol introduced simplified customs procedures, allowing Nepalese consignors to enter China with just an electronic invoice for the goods. Moreover, China will adopt an electronic tracking system, letting Nepal-bound containers clear at locations near the border. India may be compelled to simplify its own procedures if it wants to stay in business. Third, Nepal should obtain access to new markets in East, Southeast Asia and beyond. Moreover, the China route will cut shipping times and costs for certain points of origin or destination. Kazakhstan’s experience of using China’s Port of Lianyungang since the mid-1990s shows that the distance is not necessarily an insurmountable hurdle. A longer land route may also be a shorter sea route. Besides, if goods take so long when transiting through Kolkata, the use of a more distant port may come in at analogous cost. Lastly, with increased goodwill from both powers, Nepal may find the opportunity to realise its aspiration to develop into a “bridge” between China and India. For its remote and peripheral location, the case of Nepal shines light on some of the upshots of China’s push to connect the world. In particular, Nepal highlights how the Belt and Road Initiative is shuffling cards in many decks, unsettling entrenched power relations and spheres of influence. Sure enough, investing in Nepal allows China to score points in the regional and global balance of power: as has been observed, linking Nepal through roads and railways can offer an alternate route in bringing Chinese land forces closer to India. Nicola P Contessi, PhD, is an international affairs specialist with expertise in global governance, foreign and security policy, and international transportation, with a regional focus on Eurasia.